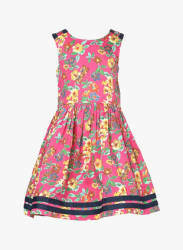 Make your little princess the center of attention as you dress her up in this pink casual dress from U.S. Polo Assn. A cotton-made, this knee-length dress displays stunning floral overall print lending her a bright attractive visual appeal. Pair this dress with matching shoes or sandals to complete her look.